Active Region 1654 on the Sun’s western limb, seen by SDO on Jan. 11. Credit: NASA/SDO/HMI team. Diagram by J. Major. Like an enormous cannon that is slowly turning its barrel toward us, the latest giant sunspot region AR1654 is steadily moving into position to face Earth, loaded with plenty of magnetic energy to create M-class flares—moderate-sized outbursts of solar energy that have the potential to cause brief radio blackouts on Earth and, at the very least, spark bright aurorae around the upper latitudes. According to SpaceWeather.com, AR1654 "could be the sunspot that breaks the recent lengthy spell of calm space weather around our planet." The image above, captured by NASA's Solar Dynamics Observatory earlier today, shows the structure of AR1654 upon the Sun's photosphere—its light-emitting "surface" layer. Stretching many tens of thousands of miles, this magnetic solar blemish easily dwarfs our entire planet. And it's not just a prediction that this sunspot will unleash a flare—it already has. Peaking at 9:11 UTC, this M1-class flare won't have much more effect on Earth than perhaps some radio and GPS interference and maybe increased auroral activity. 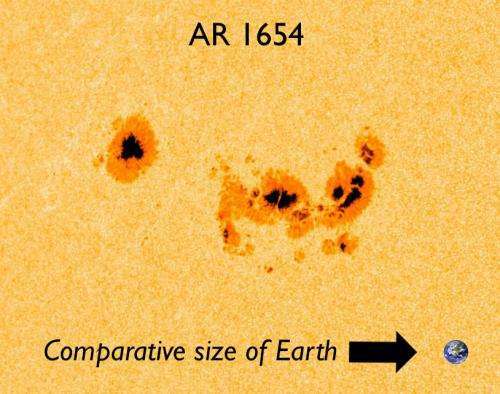 But AR1654 is still evolving and growing… and moving to face us.